Heavy rains prior to the event made for a muddy race at the fast and challenging course. Rosales took it in stride and was charging toward the front before he was punted into the wall by another competitor. After restarting last, he charged to an 11th–place finish. The sudden rainstorm prior to the green flag took many competitors by surprise. Hans Ada hit the curveball into the upper deck, getting Rosales’ car in perfect shape for the slick conditions. Although he’s the youngest competitor in the field, Rosales has made huge strides in his first season in a national series. Cheering him on are his parents, who both attend every race with their son. 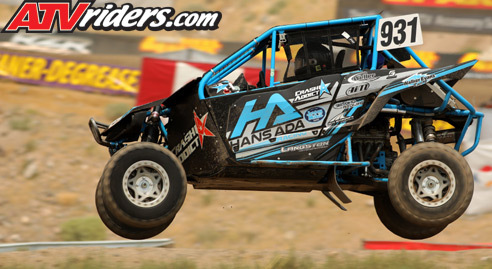 Rosales will be back in action in his Hans Ada-prepared Yamaha when LOORRS heads to Utah Motorsports Campus in Tooele, UT August 24-25.